is one of San Antonio’s finest quality jewelry stores for over 3 decades. The company opened its doors in June of 1984 on Perrin Beitel Road and moved to a larger, family-owned building on N.E. Loop 410 in May of 1995. Alamo City Gold is a full-line jewelry store offering repair service and custom designs. The company is well known nationally for its law enforcement and firefighter line of jewelry featuring badge pendants carefully reproduced to duplicate each department’s specific badge, rings designed to the customer’s specifications, law enforcement and firefighter charms and earrings. Back in 2006 the owners, Charlotte and David Putnam, decided because of their love for all that is Notre Dame and their connection to Notre Dame through family members, to apply for a license to design, manufacture and sell jewelry representing the University of Notre Dame. They were granted a Campus License and for 7 years sold their line of Notre Dame jewelry through the Alumni Association on campus. They have since applied for and were granted a national license enabling them to sell directly to the public. David earned a degree in Law Enforcement from Texas State University (formally known as Southwest Texas University) and he served in the military as a 1st Lieutenant in the United States Army. David retired as a vice detective from the San Antonio Police Department in 1990. 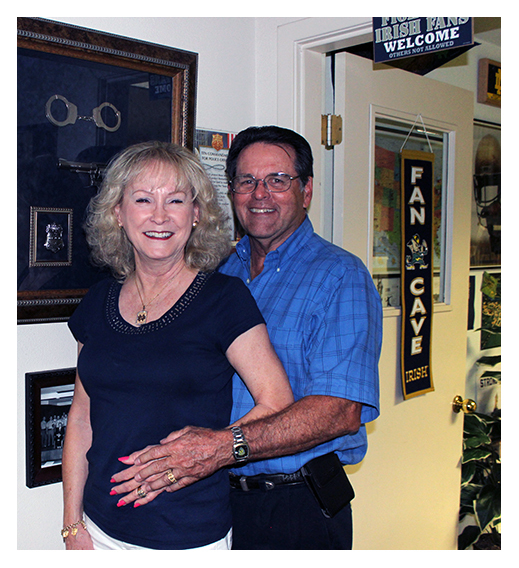 Prior to retirement, he opened Alamo City Gold & Silver Exchange. Charlotte worked for USAA, a local financial and insurance company, before joining the business in 1985. Together they are active supporters of various charitable causes in San Antonio, especially those benefiting children and the elderly. In addition, they reach out nationwide to the families of officers/firefighters killed in the line of duty by donating to them a badge pendant in sterling silver. Their long-time employees are like family members and are skilled in producing the highest quality of workmanship.